There’s a nebulous concept that’s floating around the public conscious, called quantum advantage or quantum supremacy. One of these days, someone is going to boldly declare that they’ve created a quantum computer that can solve some complex problem that a regular computer can’t. That said, quantum supremacy probably won’t be a single event. More likely it will be a slow process, beginning with a specialized quantum computer solving an incredibly esoteric problem, then progressing to increasingly important problems. While they’re not touting “quantum supremacy” officially, two teams of scientists are announcing that their quantum simulators—advanced quantum computers with very specialized scientific purposes—have made some real scientific discoveries. Brief quantum computing explanation: A computer is a machine that solves problems by manipulating a huge number of bits, physical systems with two possible options like an on-off switch. A qubit is as if that switch was on or off with some probability while it’s performing a calculation—it’s both on and off at the same time. That switch (or qubit) then takes on a fixed value once the user looks at it. The quantum computer imparts the switch with the probabilities, then solves problems by making the switches talk to one another, kind of like tying them together. There are several ways to represent these switches—all you need is a tiny system that obeys the rules of quantum mechanics with two possible states. Companies like IBM and Google are pursuing specially-fabricated, ultra-cold superconducting electronic systems. 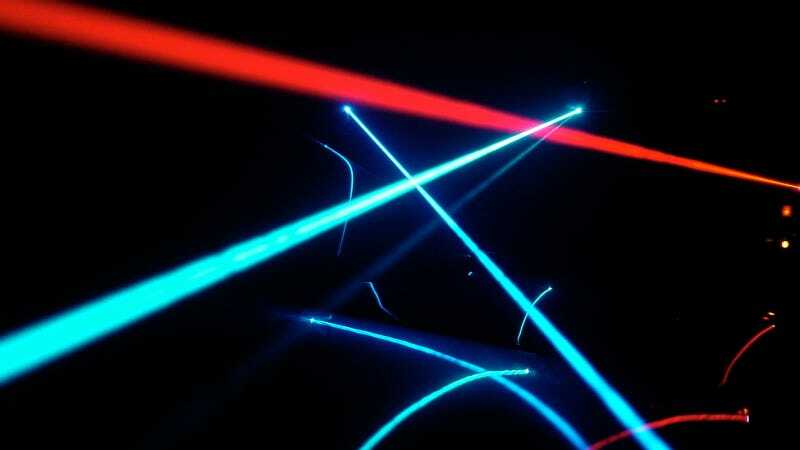 These two new teams instead trap atoms with a system of lasers. They can use the lasers to assign the specific properties to the atoms, then allow the system to change over time to simulate some problem. Each trapped atom is a qubit, and in this case, one team at Maryland created a different system with 53 qubits, and the other at Harvard, MIT and CalTech created one based on a different physical principle with 51 qubits, according to a pair of papers published today in Nature. Both systems use trapped atoms, but the way each represents the two potential qubit states are different. In the Harvard/MIT/CalTech machine, the first state is an atom with an electron close to the center, the nucleus, while the second is an atom with a very far away electron. The Maryland one relies on ions (an atom missing electrons), their spins (an innate property whose equations look a lot like those of real world spinning), and an added force supplied by the lasers. These aren’t the general quantum computers that some think may one day crack the mechanism used to encrypt your passwords. They’re very specific quantum simulators with very specific functions. “These are esoteric problems that we have solved,” said Christopher Monroe, physics professor at the University of Maryland. “In our case we mapped out a phase diagram [how the properties of the system change based on the inputs] of a toy model of magnetism.” Lukin’s team modeled how heat spreads through a specific kind of atomic system. “At the time, what we observed was completely unexpected,” he said. 51 and 53 qubits is definitely the lead for these types of systems. These trapped atom systems stay coherent for longer than the kind of quantum computers that IBM and Google are working on, meaning they take longer for their qubits to collapse into regular bits. But there are other factors when it comes to discussing how good a quantum computer is, including how easy they are to scale up and how much control there is over the qubits and which other qubits they talk to. Researchers everywhere are looking to improve all of these aspects. It will take a long time before more general quantum computers turn up. Because of the short coherence times, it can take something like a thousand physical qubits to represent a single qubit resistant to errors, the kind that would be used to make calculations. For now, these computers are best suited for physical simulations and optimization problems, explained Lukin. Ultimately Monroe (who co-founded a startup called IonQ) thinks companies like Google and IBM are overlooking these trapped atom systems. But he thinks that there will be room for several different kinds of physical quantum computers. “There’s room for CDs, magnetic hard drives and tapes,” he said. “I think the same will happen in quantum computing.